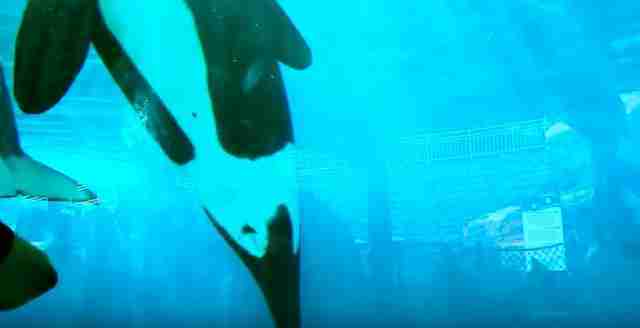 Recent footage taken at SeaWorld appears to show a mother orca who's too depressed to nurse her calf. Ingrid Visser, Ph.D., a marine biologist who specializes in orcas, and John Hargrove, a former SeaWorld trainer, recently took a trip to SeaWorld San Diego with a team from Superpod, an upcoming orca documentary project. 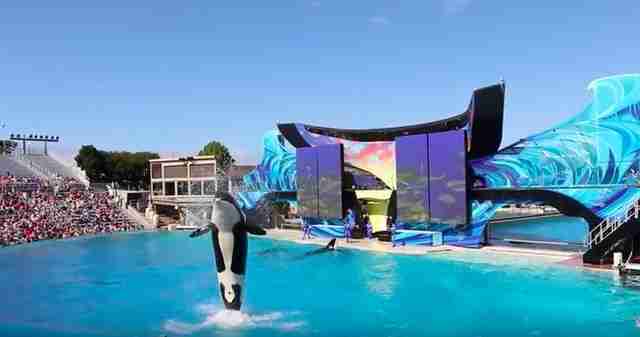 While there, they spotted an orca named Kasatka apparently refusing to nurse her calf, a 2-year-old male named Makani. 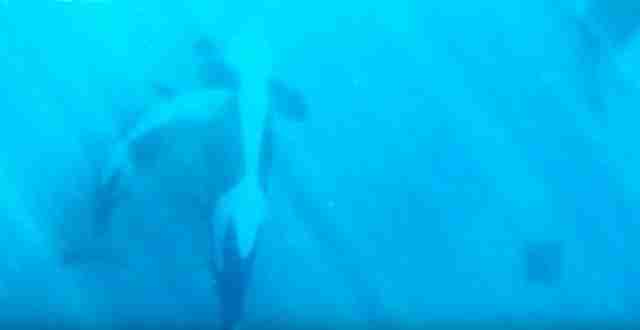 As the mother orca swims by them in her tank, her young calf can be seen bumping at her stomach. "That head-bump is a precursor to nursing," Hargrove explains. When Kasatka begins to move upward, ignoring her baby, Visser and Hargrove spot a large bruise on her belly from the calf's repetitive head butting. "That's just because the calf is constantly trying to get food, so desperately hungry, so bored," Visser explains. 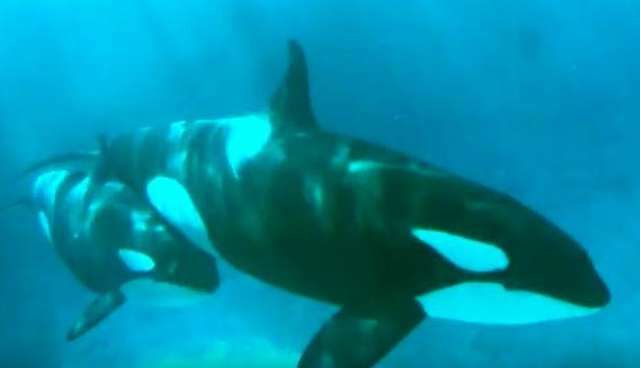 She adds that the calf's needy bumping could also be a sign of stereotypic behavior, repetitive and meaningless patterns that animals sometimes develop due to the stress of captivity - which Makani has already exhibited before. Kasatka eventually settles in the far corner of the tank, completely upright against a wall with her belly exposed to the glass. Makani continues to nudge her, circling around her and asking to be allowed to nurse. Unfortunately mother orcas can't nurse while upright, Hargrove explains, and Kasatka refuses to move from her position. "Imagine like a crying baby needing something from the mother, and the mother is so depressed, incapable of taking care of her calf," he says. Naomi Rose, Ph.D., another leading orca researcher who works with the Animal Welfare Institute, told The Dodo that she can't make a full conclusion based on the brief clip, but that the behavior exhibited by the mother whale does appear to be abnormal. "If I saw a calf head-bumping its mother over and over and nothing coming of it (no nursing observed), then I would definitely consider that abnormal," Rose said. "Normally when a calf solicits nursing that way, the mother nurses! So if she just remains vertical and stationary, then that's abnormal." She added that even without the pleading calf, the mother orca's position would be concerning. "It is not a natural position for a mother to take up - stationary for more than two to three minutes at a time is abnormal - even when resting, orcas are moving - and vertical like that, below the surface, for more than a minute or two is definitely abnormal," she said. "The calf is probably not getting the milk it needs," Rose added. SeaWorld claims that most orca calves nurse for around one year and "occasionally" up to two, but Makani, who's still trying to nursing at more than 2 years old, clearly shows the flaw in SeaWorld's weaning estimates. 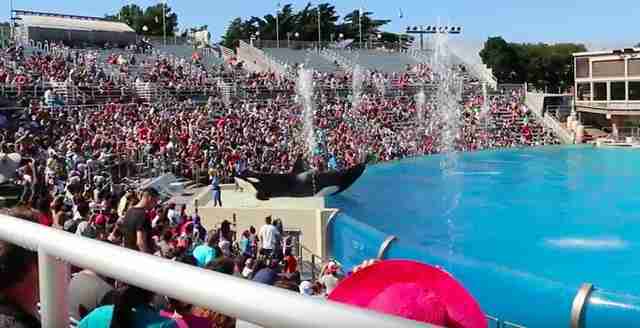 Rose said that SeaWorld uses this false claim to justify separating calves from their mothers well before it's healthy. "Some mothers allow nursing from calves who are 3, 4, 5 years old, even older – apron-string moms, you know?" she said. "Basically as long as she can produce a little milk on demand and she doesn't have another calf, the kid will get some." "I've seen pretty independent calves at one year - I've seen utterly dependent ones at three years," she added, emphasizing that there's not "clear-cut" answer for when calves stop depending on their mothers. In the video, both Visser and Hargrove touch on the anti-science mentality that leads the park to embrace a misguided and often flawed approach to interpreting orca behavior. "If you go to any SeaWorld park right now, and you ask, I doubt any of them have ever seen killer whales in the wild," Hargrove says. "There's just that type of brainwashing mentality that all the orca researchers and marine mammal scientists are crazy people." 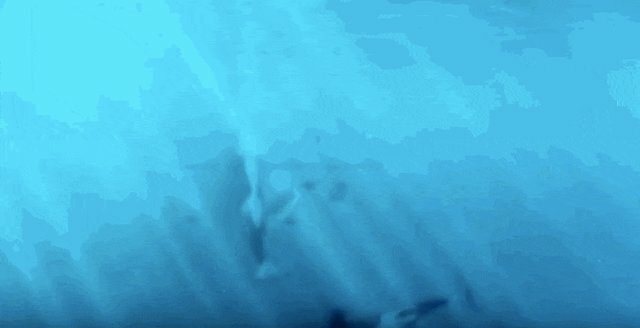 And SeaWorld certainly has a history of ignoring prevailing orca research: The park has launched commercials with outright lies about orca behavior, and frequently tells guests inaccurate "facts" such as that collapsed dorsal fins are common in wild populations or that floating whales are just sleeping. Fittingly, the video ends with SeaWorld security spotting Visser and Hargrove and kicking them out of the park, despite Visser's status as a prominent marine biologist, and despite the fact that SeaWorld often markets itself as an educational institution. "SeaWorld doesn't like me as a scientist," Visser explains. "They don't like the fact that I'm seeing things in the wild that reflect badly on them with the orca in captivity here." "A lot of the people that have never seen an animal in the wild, they've taken the behaviors that they see completely out of context," she says of the SeaWorld staff and trainers. "There's no mistaking it if you know what you're looking at, and that really is painful to watch." "It's just such a toxic place," Hargrove says.